Is the user using the universal or the picatinny rail adapter plate? What type of loctite did you use and how many inch/pounds did you torque the screws to? I am hopeing to get mine out this weekend, and have installed my P2X with red (medium) loctite and torqued the screws to 25 inch/pounds. I torqued them down pretty good and used blue loctite. I believe the issue is that the light is just too smooth to allow good purchase on it by the mount. Pretty sure the grip tape should do the trick, but there are a few ways to skin this cat. If you have a in/lbs torque, you can take it up to 60 in/lbs on the light clamp only, If anything goes wrong I will replace. Do not do this on the main body screws. But I don't think that will solve it either. If you try a tape, please report your results. When you torque it down, I presume it won't move by hand, etc? That's what has been reported, however under recoil it walks. Correct. It felt very solid before shooting, then walked out within 25 rounds or so. Peshawar - Help me understand the left / right idea better. Are you asking for a QD on both sides? The mount can be mounted with the QD on either side now, but the railed side is always without a QD as it is now. Ideally, I'd like to make the railed side with keymod top and bottom so you can add rail or QD. It's not wide enough to accommodate two keymod slots though as I am bound by the geometry of the barrel hanger. There are some ways to design around this but if these come about it will a enhancement in the future. What I mean is that it seems that it would be possible to create a left side of the main part of the mount that more mimics the right, but with the QD. So basically imagine a mirror image facsimile of the right side but with the larger QD portion on the bottom. This would allow users to flip the mount if they wanted, or use it so that the QD appears on the left or right side. Both sides would have the rail portion, and the circular light mount would be omitted in this idea. Or you can either wrap the entire tail-cap in shrink wrap or innertube. For aesthetic reasons you may try to just put innertube on the backside and that may be more than enough. The new-bies are a lot of work ! The shrink wrap is easy and non-destructive. You could carefully trim the wrap with a razor to reduce or prevent visibility. It need only be where the clamp contacts the light. There is a huge difference in surface contact area between the to different styles of Surefire P series tailcaps. The newer style is sloted instead of stippled; fortunately there are 2 groves at each end that will accommodate a snap ring. I just order a 300 ring variable size set of steel heat treated snap rings for $12, that is only 4 cents each. Once I match the correct size, I will post my findings. thats pretty sweet. wouldn't I need to take a screwdriver of some sort to disassemble for cleaning? or does it come off with the barrel? The mount and light will slide right off along the barrel. No tools needed for disassembly. Mine is due in today or tomorrow. Can't wait! As for gripping the light try a bit of 3m Vetrap bandaging tape. This non adhesive wrap works well for dumbing down rattling sling swivels etc. It stretches well and clings to itself. Always good to have some on hand if you have pets as well and I see no reason that it couldn't be used on humans. That is the cheap solution. The more expensive solution is for AVAT to mill in oring grooves in the mount and/or strap. Short pieces of oring could be embedded in each half. It would have to be glued in place unless somehow it could be "packed" in. I see no reason that it couldn't be used on humans. It is the same 3M tape that is "used" on humans......a common brand name is Coban and is offered in different colors as well. Got my mount today. Installed and ready to go. With my std 18.5" barrel the spill from the light hits back face of the front sight so I suppose I'll have to make a blinder for it. I also plan to test with my much more expensive Maelstrom MMR-X that will recharge via USB onboard. 13/16 & 7/8 inch snap rings work perfect on the slotted Surefire P2X & P3X Tail Caps. Only .04 cents each. I have an extra dozen; so if any forum members need one, send me a PM with your mailing address and I will send it gratis. That's awesome. I am not sure if you spoke with another person using the AVA, but they were also trying snap rings, o-rings and another method I am doing some cad work on. I'm confused. Why the snap ring? There has been at least two folks with P2X, P3X, 6PX style lights who have had the lights walk under live fire, despite the clamp being very tight. The light cannot be removed by hand or even wiggled. These new style surefire lights have a slick surface, concave gripping features which reduce the surface area, no positive protrusions, etc. Traditional Surefire lights have a rolled cross-hatch pattern which bites into the mount very well. Under the initial testing, I had witnessed the cross hatching bedding itself into a raw prototype mount. I put a few witness marks on the light and mount and put it through live fire testing without it moving. With the P2X, 6PX, there are several options folks have come up with and are testing. The Snap Ring being one of them, as the lights, I am told, tend to walk forward. With my schedule this time of year, I am going to have a very difficult time being able to do live fire testing but I hope to test a few methods as well. Working with another client on this as well. Hope to have some results to share before to long. Will test a number of methods. I would be interested in this mount if they made one that accepted the new, brighter Surefire lights such as the Fury and the new Scouts. As is, it appears the Fury's bezel is larger than what will work with this mount. Here's an idea... Why not offer a model with picatinny rail on both sides so I can use whichever light mount I prefer (Gear Sector, IWC, etc.)? I am interested. But, it appears there is not enough clearance from the light mount to orient a qd sling swivel in the vertical position? The light clamp side was sized for 6 Series lights with bezels of 1.25". In order keep things low profile, that was the max accommodated bezel. You can get up to 1600 lumens in that bezel size. Of course there are bezels that exceed 6" in diameter. There had to be a line somewhere, and for the initial design that is where I drew it. This is the same reason I did not do a rail on each size. Rails take up room, and then the interface to that rail takes up room and pushes the flashlight ever further from the body of the shotgun. One of my design principles in making this was "Low-Profile". I am not sure which Scout light would have an issue though, I am not aware of this. Do you have a specific Scout model in mind? In the future, if there is enough interest, I may offer a light clamp device that works with the existing mount that provides additional space to accommodate Fury size bezels. Short-term if I can get 100 orders for such mounts, it will make sense for me to make them. Short of that, I would be on the loosing side of the financial situation. If, in due time, if I am in a place where I make a second run, I would make such a clamp as well. I could also consider other design elements that have come up along the way such as flexible rails, etc. I really like the flashlight on the SBS what model flashlight is that, any mods ? 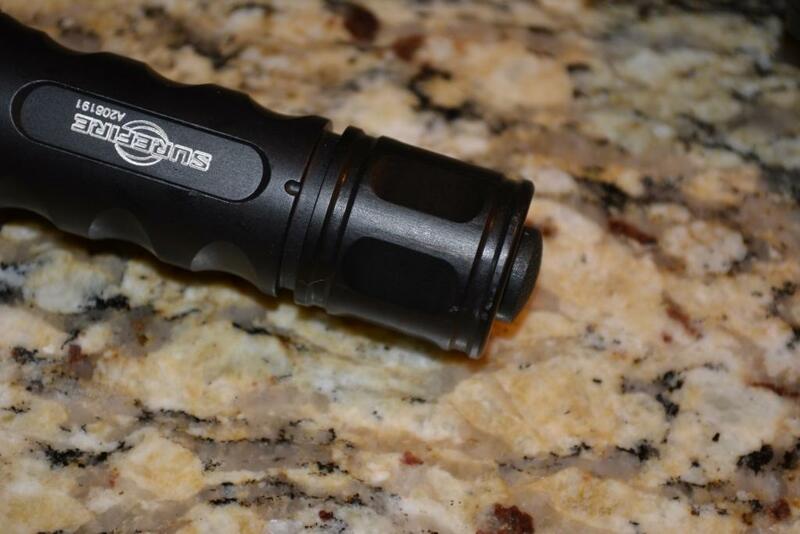 Also i was able to fit the Streamlight PT 1L flashlight . Not with a standard QD. There are male side QDs that would work, they are offset. I will look for them a bit later today. Example of an "Angular Sling Attachment"
I believe that is an E1B / E1 Backup. No mods to it. That is not the light I use, however, it was used for fitment testing, etc. 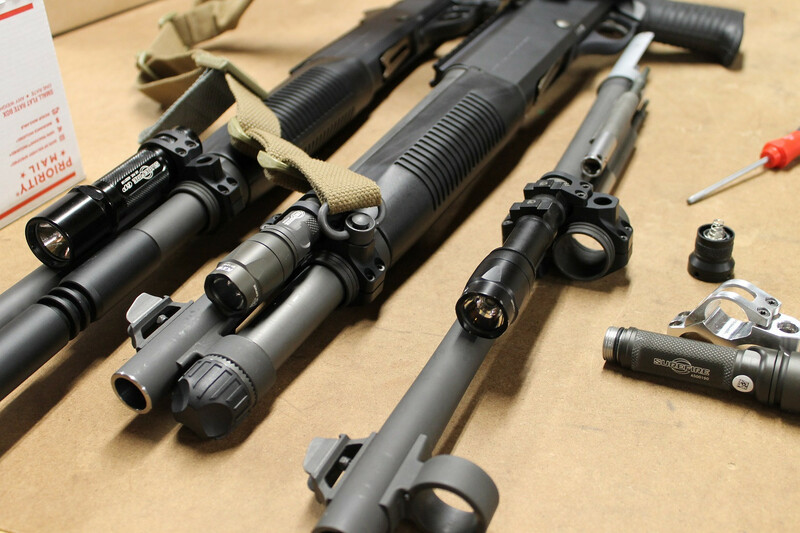 A L4 Lumamax with a KE2-A head is tad bit longer but not longer than the entry barrel and is very bright. Same light body/shape other than it accommodates and extra 123 style cell.